Moorehead (1929: 83-84) suggests that Mound 65 is “South 9° East, 994 feet” (303 meters) from Mound 64. Patrick records Mound 65 as a rather large, conical mound but does not give a height. McAdams in 1882 indicates a height of 25 feet (7.6 meters) and the Peterson-McAdams Map of 1906, 20 feet (6.1 meters). Using the 127-meter (476.7-foot) contour as a base line, the 1966 map shows a height of 6.2 meters (20.3 feet). 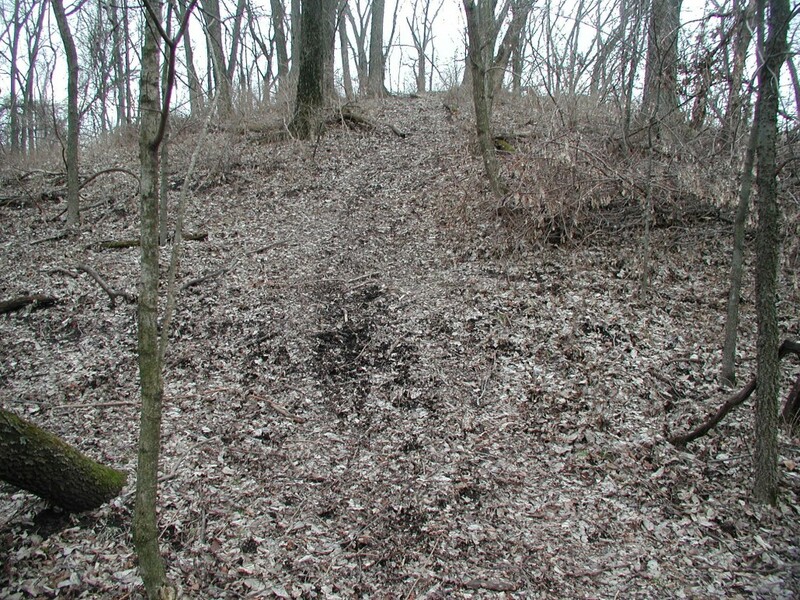 There are several references to Mound 65 in Moorehead’s discussion, but usually in connection with other mounds. However, on one occasion, Moorehead (1929: 76) said: “Tests on Number 65 were completed by June 20…. There is a complete series of thirty-five or more maps on Mounds 65, 66 and other mounds, on file in the Museum of Natural History of the University of Illinois” (Moorehead 1929: 80). Above this stratum of sand was found a deposit of stiff multicolored gumbo or clay in which red and yellow and their various shades predominated, and which for want of a better name, has been indicated… [in] cross section maps of this mound under its local name of ‘shale’. This stratum reached a maximum thickness of two feet under the central portions of the mound, but pinched out and disappeared altogether within from ten to twenty to twenty-five feet of the mound’s perimeter. This might lead to some speculation as to whether No. 65 was built on a low natural mound, speculation that is rather encouraged by examination of stratum immediately above the shale. This is a deposit of gray sandy gumbo, averaging less than twelve inches in depth, and always decreasing in every direction toward the perimeter of the mound. At a point within three feet from the east end of the major axis it disappears completely, only to reappear in increased depth two feet higher and twenty feet further east whence it sloped eastward under something more than a foot of pure gray sand. Extending the entire length of the major axis and across at least the south half of the mound’s base, we found a sharply marked deposit of black gumbo, so dry and hard along the minor axis, where we sunk a line of test holes, that it was difficult to cut and so loose after being cut that it could hardly be kept in the augers for removal. At twenty feet… the augers went through a foot of hard dry sand, an entirely new formation to us but which was encountered later at eighteen feet under Stn. [station] 6, where it was nearly four feet deep and at about twenty and six-tenths feet under Stn. 18… where it was about two feet deep… these sand deposits… Iied at or below base and… under extremely dry and very hard black gumbo.